It may also be used to drain a build up of acid or fluids. This may be needed with blockages such as those caused by a cancer growth. Talk to your doctor about your medicine. You may be asked to stop taking some medicine up to one week before the procedure. Avoid food or fluids after midnight before surgery. 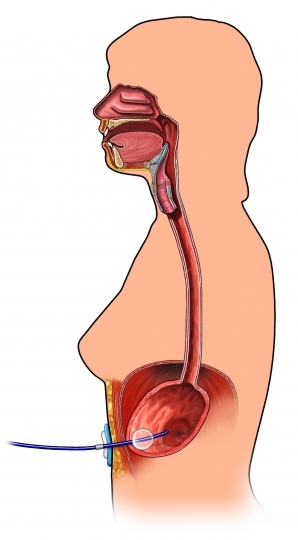 A gastrostomy may be done at the same time as another stomach surgery. An incision will be made through the skin and the belly wall. The last cut will be made in the stomach. A tube will then be placed through the skin and into the stomach. This tube will be stitched in place. The incision will be closed. The doctor will make sure that the tube is placed correctly. You will be moved to the recovery room. The care team will watch you for any complications. The area will be painful after the surgery. Medicine will help with the pain until you heal. This procedure is done in a hospital setting. You will stay 1 to 2 to make sure the tube is secure. Your doctor may choose to keep you longer if complications arise. You may need to get nutrition through an IV for the first couple of days. Clear liquids will be passed through the tube first. You will then be moved on to thicker liquids. The care team will show you how to use and care for the feeding tube. The care team will also talk about any possible complications. Tube becomes dislodged. This is most common in first 2 weeks. If the tube is left out the opening can close. Tube becomes clogged or does not work well. Gastrostomy tube (g-tube). Kids Health—Nemours Foundation website. Available at:http://kidshealth.org/en/parents/g-tube.html. Updated January 2018. Accessed January 10, 2018. Gastrostomy tube (g-tube) home care. Cincinnati Children's website. Available at: https://www.cincinnatichildrens.org/health/g/g-tube-care. Updated July 2016. Accessed January 10, 2018.